Optimized drilling once meant drilling farther and faster to achieve high rates of penetration (ROP) using efficient, cutting-edge technologies and approaches like pad drilling. Today, with oil prices remaining low, that need for speed has given way to a more balanced approach, with operators taking a step back and a wider view of downhole drilling optimization. 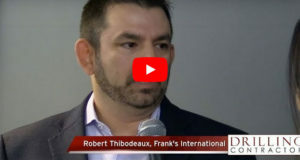 Click here to watch a video interview with Jon Rhodes, Drilling Services Business Development Manager for Baker Hughes, on the company’s new drilling optimization service. 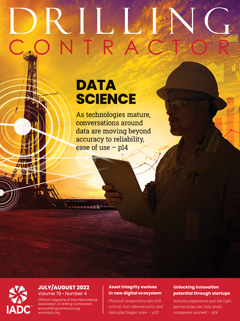 Sophisticated sensors, significantly improved data management and analysis, automated systems that take humans out of the loop and real-time monitoring are helping drillers to manage costs and gain efficiencies. ROP and efficiency are still important – yet, utilizing data more effectively to understand the drilling process and to extend bit and equipment life and reduce the number of trips downhole are also critical to increasing well value and maximizing assets. • Training crews to interpret large amounts of complex data and downhole situations and increased use of automated systems that take humans out of the loop or tell drillers what actions to take. 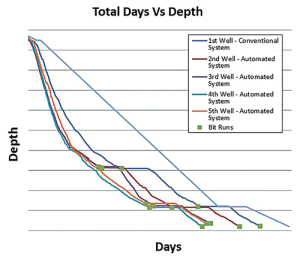 This days-vs-depth curve from the November 2014-December 2015 deployment of an automated downhole drilling system by Hess Corp in the Bakken illustrates the vertical and curve interval in a horizontal well. 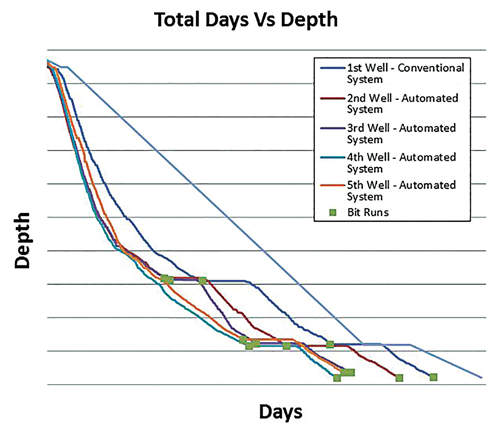 The example shows the improved impact of using downhole measurements and automation tools. The initial well was drilled conventionally, with time captured from the start of the trip into the hole until the end of the trip out. Then, five intervals were drilled using the automation system. Each interval was completed in 13-51 hours less time than the 182-hour average interval time from the rig’s previous three pads. • A well-to-well cycle, where the drilling system can be changed substantially. IntelliServ2, NOV’s latest-generation wired drill pipe, includes data link repeaters placed along the drill string to boost signals to the surface, a network controller at the surface and improved inductive coils. NOV anticipates 16 permanent WDP installations by the end of 2016. The eVolve service provides tiered drilling optimization capabilities using downhole tools and surface automation to feed real-time downhole data into the rig’s control system. The system’s ADVISE tier, which uses memory tools, can be installed on any rig in the US. The AUTOMATE tier delivers optimization using downhole tools linked with the company’s IntelliServ Wired Drill Pipe Network (WDP) to send data back to the rig. 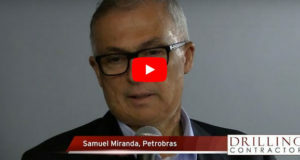 “We’re talking about optimizing the entire drilling process, which can only happen by connecting what is going on dynamically at the bottom of the hole back to the machine at the surface,” Mr Pink explained. In this illustration, a large-hole BHA is crossing a formation boundary and experiencing severe backward whirl. The motion is detected downhole by the OptiDrill service’s sub and displayed in real time with a recommended mitigation on the rig-site display. 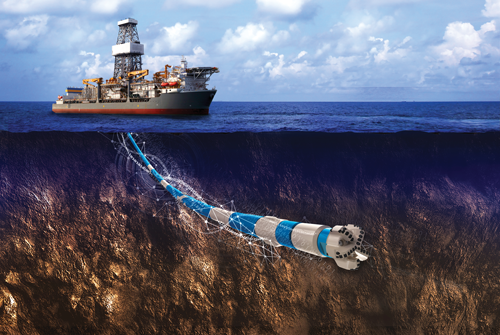 Image Courtesy of Schlumberger. 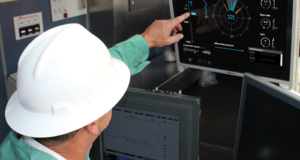 The AUTOMATE tier has saved operators more than 30% of rig time in the Eagle Ford and Bakken plays, he added, and is seeing strong interest in Norway, where it has been installed on two jackups, the Maersk Intrepid and the Rowan Viking. IntelliServ2, NOV’s latest-generation WDP, upgraded in 2014 and 2015, delivers increased reliability and ease of use at a reduced cost of ownership, said Brian Van Burkleo, Director, Business Development for IntelliServ. 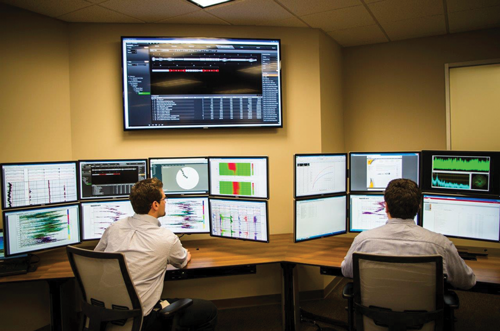 “Operators, of course, rely on downhole data to drill wells. WDP enables this same critical data to simply be acquired faster. It’s about small but frequent time savings in surveys and downlinks.” Whereas conventional mud pulse telemetry operates at 6 to 12 bits/sec, WDP delivers 57,000 bits/sec, he noted. Mr Van Burkleo anticipates the technology is entering a growth phase with the new-generation system, which includes data link repeaters placed along the drill string to boost signals to the surface, a network controller at the surface and improved inductive coils. 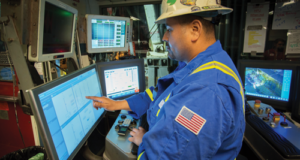 The first IntelliServ2 string, installed on a rig in December 2014 in the Bakken, has drilled more than 140,000 ft. On one 16-well project, the system’s high-speed telemetry capability enabled immediate transmission of downhole data and closed-loop drilling automation, reducing drilling time by multiple days per well compared with previous vertical and curve pads. At the end of 2015, NOV had four permanent WDP installations globally and anticipates 16 permanent installations by year-end. 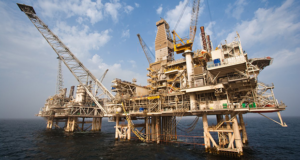 “Where we’re seeing the greatest adoption and WDP delivering net cost savings to operators are those high-volume, high-cost multiwell fields in the North Sea and offshore western Australia, and high-volume, low-cost wells on US land, the Middle East and Southeast Asia,” he said. Interpretation of downhole data is a key focus at Weatherford, which recently established a global Drilling Engineering and Optimization group to ensure consistency and best drilling practices in addressing downhole issues, such as torque-and-drag and stuck pipe. Improvements in sensors to capture high-frequency downhole data have enabled the industry to move from recording one data point every five seconds to 1,000 samples per second. • An interface that integrates downhole and surface algorithms to provide automated answers that facilitate clear directions to the driller. Instead of a red light or alarm that signals something is wrong, animations illustrate what is actually happening in real time, indicate the severity of the situation and present a diagnosis. 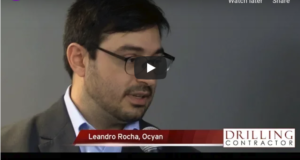 “It provides specific directions for optimizing drilling parameters, such as increasing weight on bit (WOB) or rpm by a specific amount,” Mr Arevalo explained. • High-level, often remote, interpretation of data using real-time models of aspects of the drilling process to understand longer-term trends. The Quasar Pulse M/LWD service, developed by Halliburton’s Sperry Drilling PSL business line, has improved drilling optimization in extreme environments by obtaining measurements previously unavailable. 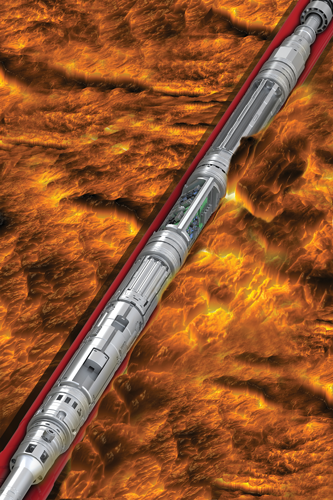 In 2014, the tool, rated to 392°F (200°C), helped an operator drill to TD in a high-temperature well in a single run. 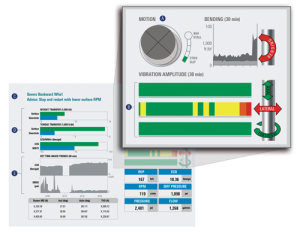 The Schlumberger ROPO rate of penetration optimization software, the latest version of which was introduced in 2014, reads real-time drilling data and provides an optimum set of parameters, specifically rpm and WOB, to obtain maximum ROP in any circumstance. In the planning phase, the drilling team establishes a drilling envelope based on the constraints of the drilling system and the formation. Weatherford, which is also placing more emphasis on pre-job planning, recently established a global Drilling Engineering and Optimization group to ensure consistency and best drilling practices in addressing downhole issues, such as torque-and-drag and stuck pipe. The company is ready to begin field trials of a new torque-limiting tool, which is expected to demonstrate significant improvements in ROP while also reducing damage, Mr Lines said. Mr Goodwin, who is also product champion for the JetStream RFID circulation sub introduced in 2015, said RFID tools provide greater operational flexibility and efficiency than mechanical ball-drop activation systems. The latter are often limited by the restrictive inside diameters (ID) of M/LWD systems. RFID technology allows tools, such as underreamers to eliminate ratholes and circulation subs for wellbore cleaning, to be deployed on the same BHA and independently controlled. The technology enables the underreamer to open and close as many times as needed and allows the circulation sub to be activated to clean the wellbore without making a second trip. 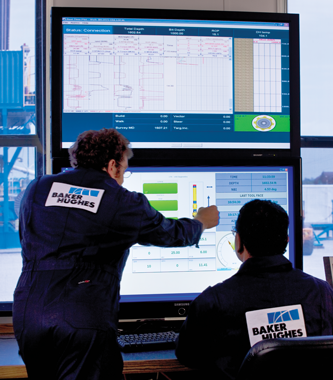 Baker Hughes drilling optimization engineers monitor the rig site and provide real-time feedback to the rig crew to optimize drilling parameters for improved drilling efficiency. 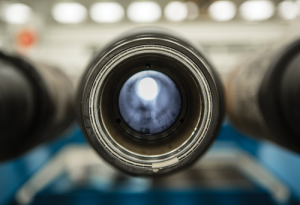 This year, Baker Hughes will launch an enhanced drilling optimization service with the capability to acquire high-frequency downhole data, both in real time and in memory, for post-well analysis to better understand what is happening downhole. 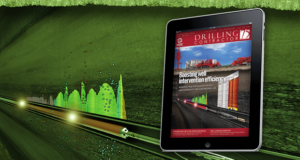 Complementing the vibration monitoring is drilling efficiency software that combines a geology model with a mechanical model of drill bit behavior to calculate the optimum drilling parameters needed to achieve expected penetration rates, creating a road map for the driller. With real-time capability, the system updates rock strength calculations based on rock drilled to compare actual drilling parameters, such as weight, rpm and flow rates, with optimum values to help achieve the best ROP and maintain bit life. “The recommended instantaneous ROP may be slightly slower, but if it extends the bit life so the overall shoe-to-shoe time is less, the net gain can be more than if we drill too aggressively and wear out bits prematurely,” Mr Greenwood noted. 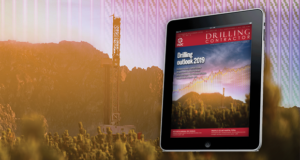 A third system quantifies where efficiencies actually were derived during the drilling process by determining the time spent on over 40 activities within the categories of drilling, tripping and making connections. Developed to obtain measurements that were previously unavailable, Sperry Drilling’s Quasar Pulse M/LWD service with MWD and LWD tools rated to 392°F (200°C) helps reach TD in a single run in high-pressure, high-temperature offshore wells. In 2014, the service, along with an adjustable gauge stabilizer, was run in five wells from a platform rig in Southeast Asia. In a single-run performance where circulating temperature reached 369°F (187°C), the system drilled and logged 7,593 ft (2,284 m) to TD at 12,946 ft (3,946 m) for an average ROP of 101.4 ft/hr (31 m/hr). 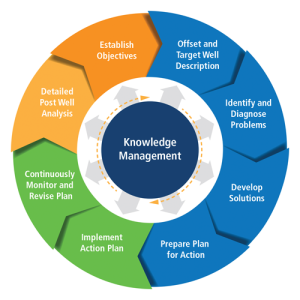 Baker Hughes applies a systems approach to drilling optimization using a Knowledge Management Wheel that outlines the process, from establishing clear objectives to detailed post-well analysis. • A high-level systems approach that looks at the entire drilling process by gathering offset data on similar well types, actively managing parameters while drilling and doing in-depth pre- and post-well analysis to optimize current and future wells being drilled. Which level to apply is often determined based on the cost and complexity of the well. 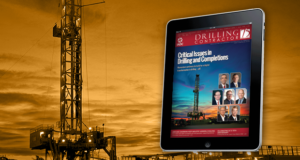 “The more expensive the well, the bigger the prize of improving drilling efficiencies. An exception could be in the case of a specific issue, such as stuck pipe or vibration damaging the BHA,” Mr Rhodes said. 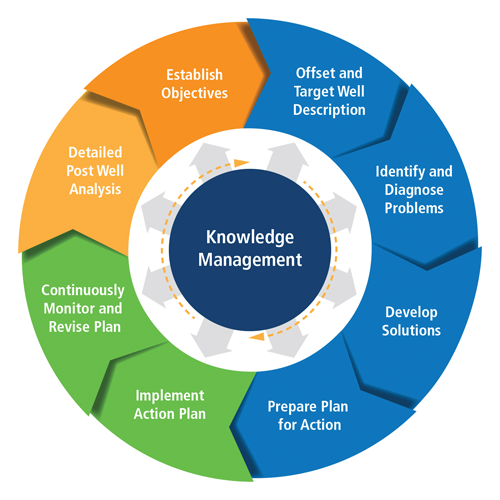 Baker Hughes applies a systems approach to drilling optimization using a Knowledge Management Wheel that outlines the process, from establishing clear objectives to detailed post-well analysis, with downhole data provided by the company’s CoPilot real-time drilling optimization service. In 2015, the method was used to improve hole quality and enhance production in a North Sea directional well. A high-efficiency PDC bit was optimized using a bit tilt analysis, while the BHA was enhanced with a rotary steerable system. The drilling optimization service was applied to further reduce downhole drilling dysfunction. The well was drilled to TD in one run as planned, with a below-rotary table time of 13 days compared with the planned 26 days. eVolve and IntelliServ are trademarks of NOV. OptiDrill and ROPO are marks of Schlumberger. JetStream is a registered term of Weatherford. DrilSaver is a trademark of Halliburton, and Quasar Pulse is a service mark of Halliburton. CoPilot is a trademark of Baker Hughes. 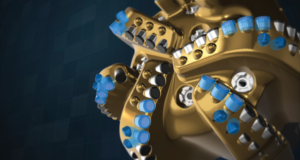 Click here to view a video of Schlumberger’s OptiDrill service. 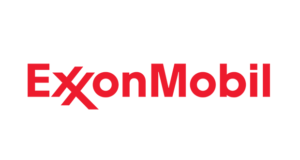 Click here to read about Petrolink’s use of cloud-computing. At the end of 2015, NOV had 4 permanent IntelliServ Wired Drill Pipe Network installations globally and anticipates 16 permanent installations by the end of 2016. Improvements in sensors, with an emphasis on capturing high-frequency downhole data, have enabled the industry to move from recording 1 data point every 5 seconds to 1,000 samples per second. Sperry Drilling’s Quasar Pulse M/LWD service is rated to 392˚F (200˚C). 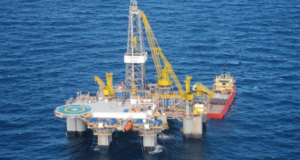 It has been deployed to help operators reach TD in a single run in high-pressure, high-temperature offshore wells.